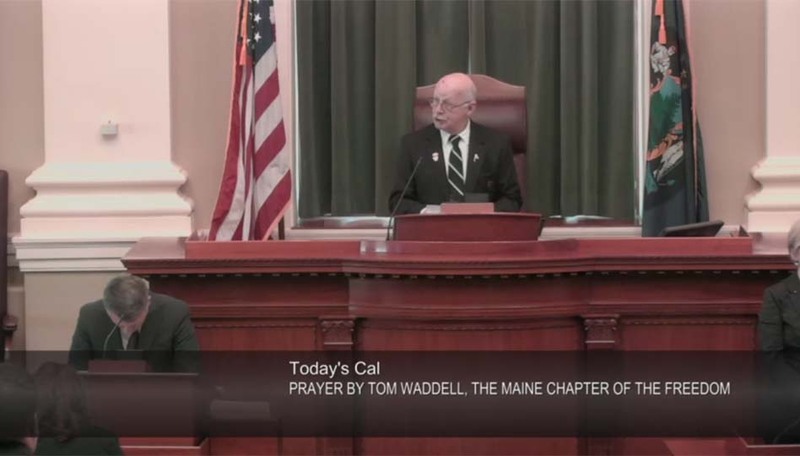 Tom Waddell, the President of the Maine Chapter of the Freedom From Religion Foundation gives the morning “prayer” in the Maine House of Representatives on April 2, 2019. Picture is from actual video of Maine House proceedings. AUGUSTA – Tom Waddell said he was going to make an “inspired invocation” to start the day for the Maine House of Representatives after acknowledging Speaker Sara Gideon and Rep. Kent Ackley, a liberal independent legislator who represents him in the Maine House. It was unusual that Waddell, of all people, was listed on the calendar to offer the morning prayer, because Waddell is the President of the Maine Chapter of the Freedom From Religion Foundation, an anti-religion group for atheists and agnostics. While Waddell’s “prayer” was itself mild and did not seem to stir any controversy, the organization he was representing is not shy about criticizing and mocking people of faith, particularly Christians and Jews. On the website of the national Freedom From Religion Foundation, several scrolling images directly on the front page mock Christians for their beliefs. And a third shows a woman’s face in a graphic that looks like the horns of Satan with the words “NOT AFRAID OF BURNING IN HELL” and “UNABASHED ATHEIST” under her name. In an ironic twist, the Freedom From Religion Foundation’s official Twitter account today railed against organized prayer in state legislatures, as can be seen in the tweet embedded below. "Organized prayer at state legislatures may be legal, according to the Supreme Court, but this week has shown that it’s also divisive, unnecessary, and wrong." The Freedom from Religion Foundation is known for filing lawsuits against Christian and Jewish groups and individuals across the country. Those suits include an attack on a World War II memorial statue of Jesus, an attempt to force the state of Ohio to remove the Star of David from a Holocaust memorial and an attempt to intimidate cheerleaders into ending their practice of putting Bible verses on spirit banners. While their lawsuits have largely been failures, one of the Freedom From Religion Foundation’s slogans is “nothing fails like prayer” and the group even runs an annual Nothing Fails Like Prayer Essay Contest. It is unclear who determined that a “prayer” from an anti-religion advocate qualifies as a religious service under House rules.